The Shiromani Akali Dal is set to change more than 30 per cent of its sitting legislators in a bid to blunt the anti-incumbency factor in the coming assembly elections. It is likely to field bureaucrats as well as senior police officers on seats where few are ready to throw their hat in the ring. Landowners, whose land and dwelling units have been acquired by a government agency or a private builder for a residential, institutional, industrial or integrated mixed land use estate, will no longer be left shelter-less. Punjab Pradesh Congress Committee president Capt Amarinder Singh today said he would be writing to the Election Commission for getting all the “partisan” officials replaced to ensure free and fair elections in the state. Deputy Chief Minister Sukhbir Badal today said the “admission of guilt” by the Congress regarding the involvement of its party leaders in the killing of thousands of Sikhs in its book, “A Centenary History of the Indian National Congress”, and yet decorating the “killers” with party posts reflected the true character of the Congress. He said he would ask legal luminaries to examine whether the “admission of guilt” by the Congress in its publication could be used as evidence against the accused in various cases. In a bid to boost power generation, the Punjab Government has okayed a project whereby solar panels would be established over canals. Chief Minister Parkash Singh Badal, in a release, said it was only the second such venture outside the United States. He said P4P Private Limited would establish a 1 MW solar canal cover as a pilot project. Forty years is a long time to fight against a slow-responding and insensitive bureaucracy. This fight becomes more difficult for an elderly widow, who is rustic, illiterate and abandoned by her kin. But 90-year-old Kartar Kaur has finally emerged triumphant. Extending support to the peaceful campaign by Anna Hazare and other members of civil society against corruption, the People’s Party of Punjab (PPP) today said that those indulging in corruption would have to be defeated in the elections. To streamline the functioning of the Congress in Punjab and formulate an election strategy, Gulchain Singh Charak has convened a meeting of the newly constituted PPCC and other office-bearers at Chandigarh on Saturday. The Punjab Medical Entrance Test (PMET 2011) of the Baba Farid University of Health Sciences (BFUHS) was conducted in an orderly manner here today. About 9,000 candidates aspiring to secure a berth in the total 1,700 seats for the MBBS/BDS courses in nearly two dozen medical/dental colleges affiliated to the BFUHS took the entrance test. Barring an incident connected with the inadvertent entrance of a teacher of a pharmacy college in Amritsar into one of the examination centre set up in Balbir School, Faridkot, the Punjab Medical Entrance test (PMET) — 2011 was conducted in a free and fair manner amidst heavy security arrangements. Despite an alarming rise in road accidents, there seems to be little improvement in basic infrastructure of the Traffic Police Department. Of the three highway patrolling vehicles deployed on the Delhi-Amritsar, Chandigarh-Ludhiana and Sirhind-Patiala roads to help accident victims, one has been in a workshop for the past three days. At the moment, the other two are forced to cater to a length of 69 km. Gurpreet Singh Shergill of Majhal Khurd village here has, due to his foresight and hard work, scripted such a name for himself that his success story in floriculture is an apt example for other farmers to emulate. The National Commission for Minorities, under the Ministry of Minority Affairs, has sanctioned a major project to Punjabi University, Patiala, for conducting a study on “The socio-economic conditions of southern Sikhs in particular and minority Sikh communities settled in South and North-East India”. Various associations of medical practitioners have hailed the decision by the state government to enhance the non-practicing allowance (NPA) to the Punjab Civil Medical Services (PCMS) doctors with effect from January 1, 2006. The Municipal Council today surrendered the mini bypass project to the district administration. The decision was taken at a meeting attended by councillors from the ruling as well as opposition parties. The Additional Chief Judicial Magistrate, Hoshiarpur, Jaswinder Shimar, today accepted a plea seeking registration of a criminal case under Sections 295A, 500 and 501 of the IPC against AICC general secretary and former Madhya Pradesh Chief Minister Digvijay Singh for allegedly describing Yoga Guru Ramdev as a “maha thug” (swindler). Three residents of Bhuakheri village have been booked under various sections of the Prevention of Cruelty to Animals Act for mercilessly thrashing a bull with sticks. SAD sources said party president Sukhbir Singh Badal was undertaking an assessment and that there was a realization that a number of non-performing party legislators would have to be dropped. There is a feeling in the party that this exercise would better its prospects in the assembly elections next February. Sukhbir Badal, when questioned on this, said some legislators would have to be changed due to the delimitation exercise. “The performance of legislators will be the sole criterion for granting the party ticket. We will change legislators who have not been able to perform as per the aspirations of the people,” he said. The SAD may field senior bureaucrats and police officers and may woo the family of veteran actor Dharmender to add glamour to the poll race. Principal Secretary to the Chief Minister, DS Guru, is almost certain to be fielded from the Bhadaur reserved constituency in Barnala district. State police chief PS Gill, who is due for retirement in a few months, is being projected as a candidate from Moga. Gill’s father Nachhatar Singh has represented Moga albeit as a Congress candidate. Senior leader and former minister Tota Singh, who has consistently fought from Moga on the SAD ticket, is said to be keen to shift to the Dharamkot constituency. The sources said there was a strong possibility of Ludhiana Additional Deputy Commissioner SR Kaler being alloted the party ticket from the Jagraon reserved constituency. Former DGP Mohammad Izhar Alam may get the ticket from the Malerkotla constituency. Among a few more police officers reportedly vying for the SAD ticket is the former DIG, Ferozepur Range, Harinder Singh Chahal. Sukhbir, when questioned on the bureaucrats and police officers tipped for the party ticket, said an assessment of all seats was underway and it was too early to comment on the issue. “All options are open to the party,” he added. A few senior leaders might see their ticket being allocated to their kin. The SAD is growing increasingly confident that People’s Party of Punjab (PPP) chief Manpreet Singh Badal will not be able to lure away its senior leaders and that Manpreet’s influence needs to be countered by putting up the best candidate in each constituency. Sukhbir claimed Manpreet’s anti- government tirade had lost steam and only leaders rejected by the SAD were likely to join him. The acquiring agency will have to provide a built-up house within two years from the date of taking possession of their land. The decision forms part of the Punjab Housing and Urban Development Department’s new oustess policy recently approved by Chief Minister Parkash Singh Badal. Framed on the recommendations of a committee constituted following a recent decision by a full Bench of the Punjab and Haryana High Court, the policy now makes it mandatory for a private developer to give adequate land compensation and a built-up house, if the acquired land includes a dwelling unit. However, the size of the house to be provided by the developer will be proportionate to the covered area of the dwelling unit in which the landowners resided, subject to the condition that the minimum covered area should be 20 sq m. The benefit will be in addition to a residential plot to be offered to the landowner. Sources said an important aspect in the new policy was the inclusion of land for institutional projects. Previously, the benefits were not handed over the landowners whose land was acquired for institutional projects. The government did not consider a proposal to include the landowners whose land had been acquired for roads. It has also been decided that 10 per cent of the total residential plots in any estate will be allotted to the oustees, subject to the limitation that total reservation does not exceed 50 per cent. The landowners whose land has been compulsorily acquired will be entitled to take benefit under this scheme, even if they have taken one or more plots under the land-pooling scheme. Interacting with mediapersons after meeting party workers from various Assembly segments here, Amarinder claimed that these officials who belonged to both the police as well as civil administration necessarily needed to be removed. Revealing that several cases of police highhandedness were brought to his notice by party workers, he alleged that the Akalis were unceasingly harassing the Congress supporters. Quoting a few instances, he claimed a false case had been slapped on 31 members of the family of Puran Singh, an ex-serviceman and an ex-sarpanch of Badri village in Ajnala tehsil. Those booked included his 90-year-old mother too. In another case, octogenarian mother of a party worker, Bhupinder Singh, was charged under Section 420 of the IPC. “Is this democracy?....It’s a shame… every guilty official will be held accountable for his deeds,” he warned. Asked would he take up the issue at some forum, he said it was a matter of another six months and he would do it himself. On the issue of Baba Ramdev, he said it will not have any impact in Punjab and that the Union Government was right in taking whatever steps it took. To a question whether the District Congress Committee presidents could contest the forthcoming Assembly polls, Amarinder clarified there was no restriction on anybody to contest. Indiscipline once again came to the fore during the former CM's visit as the Congress leaders jostled with each other to sit near him during the press conference. Prominent among those present included Tript Rajinder Singh Bajwa, Harpartap Singh Ajnala, Lali Majithia and Savinder Kathunagal. Amarinder Singh visited the protesting Khalsa College teachers on Wednesday and said “he would not allow the conversion of the historic college into a private university”. He said if the Akali-BJP government went ahead with the proposed move, the Congress, on coming to power, would reverse the decision. Amarinder warned SAD MLAs Bikram Majithia (in pic), Virsa Singh Valtoha and Veer Singh Lopoke, against whom Congress workers complained to him today, to stop "acting like goons lest they will have to pay for their acts of omission and commission when Cong assumes power”. Gulchain Singh Charak has said he has asked Amarinder Singh and other senior office-bearers to be more accessible to the people and party workers. He was talking to the media after attending the bhog ceremony of Sant Baba Sant Singh at Guruwali village, 5 km from here. Punjab would soon be a cleaner state with a door-to-door garbage collection initiative in all townships by mid September, he said. “Bidding by big private companies is on. The Punjab land-scape is set to undergo a sea change,” claimed the Deputy CM after a surprise check of the ongoing projects in the city. The Jalandhar administration was taken off guard as Sukhbir’s chopper landed at the Burlton Park Stadium. He headed straight for Guru Gobind Singh Stadium. Concerned over the tardy progress of the renovation work, he ordered that it be completed by mid-September to host the Kabaddi World Cub. In a bid to boost power generation, the Punjab Government has okayed a project whereby solar panels would be established over canals. Chief Minister Parkash Singh Badal, in a release, said it was only the second such venture outside the United States. He said P4P Private Limited would establish a 1 MW solar canal cover as a pilot project. The project, said he, would not only save canal water up to 5 million gallons a year by reducing evaporation but also ensure utilisation of the space over canals. P4P founder Steven Congar along with owner Jessie Singh assured the Chief Minister that the pilot project would be commissioned within six months. Amritsar: The Union Government proposes to install a solar city cell in Amritsar, the Commissioner, Municipal Corporation, DPS Kharbanda, said at a meeting here today. The city is being developed as a solar city by the Ministry of New and Renewable Energy that has sanctioned an initial Rs 20 lakh for the purpose.The Punjab Energy Development Agency (PEDA) has been designated the nodal agency. The Director of the ministry, Dr Arun K Tripathi, explaining the scope of the project, said: “With the installation of the solar system, besides countering power deficiency, the power bills of the domestic consumer will come down by 30 to 40 per cent”. Elaborating the initiative, the Joint Director, PEDA, MP Singh, said a programme had been chalked out to educate the public on the usage of solar energy. “The solar city cell would be a learning platform for the pubic on the advantages of solar energy.The people would be persuaded to opt for the non-conventional source of energy to run their home appliances”, he said. Among those who attended the meeting were president of the Rotary Club APS Chatha, the head of the architect wing of GNDU, principal of DAV Public School Neera Sharma, the Chairman of Kochhar Infotech and officials of the MC and the Pollution Control Board. She fought a long-drawn legal battle at a ripe age against the Indian Railways from the lower courts to the apex court to get family pension and gratuity that were denied to her on flimsy grounds for many decades. Kartar’s husband Kartara Singh worked as a gateman in Indian Railways for 26 years in Bathinda district. He joined service in 1944 and was given compulsory retirement in 1970 due to physical disability. He died in 1971. Kartar Kaur has been staying in Pharwahi village of Barnala district. Penniless and abandoned by her near and dear ones, she was helped by a group of lawyers, including Amarjit Singh Kaushal, Kamal Kant Dixit (Bathinda), YR Sharma and Manjeet Chawla (Supreme Court). The triumphant point in her life came on May 24 when the Vacation Bench of the Supreme Court comprising Justice GS Singhvi and Justice Chandramauli K Prasad directed the Indian Railways that senior functionaries of the department should ensure the payment of family pension to Kartar Kaur every month without fail. The Vacation Bench, while dismissing the special leave petition (SLP) filed by the Indian Railways against the decision of the Punjab and Haryana High Court, also ordered that senior functionaries of Indian Railways would help Kartar Kaur open a bank account in her village apart from ensuring that she must get pension arrears within the time period specified. Lawyer Amarjit Singh Kaushal said that Kartar was not given pension for 16 years by the Indian Railways after the death of her husband. She was again denied pension and other benefits by the officials concerned despite the fact that the Indian Railways sanctioned her case for family pension on January 1, 1986. Kartar Kaur said that though she was forced to go from pillar to post, she never greased the palms of any official. The PPP chief, Manpreet Singh Badal, said his party was the first to announce a crusade to rid the country of corruption, black money and drugs. He said people like Anna Hazare and Baba Ramdev should enter the political arena to defeat the corrupt forces. Manpreet Singh said there was a need to change the system if corruption was to be eliminated. The PPP chief said it gave him much satisfaction that the issues raised by him several months ago were now centrestage of national politics. He said he had addressed hundreds of meetings in various parts of the state during the past eight months. “From my interaction with the people, I can say with confidence that there is a movement building up in the state against corruption. People are all for cleansing the system and are ready to support the forces making efforts in this direction,” Manpreet Singh said. Later, he addressed a rally in Amritsar too. Charak said office-bearers down to the block level had been invited so as to involve them in the process and also provide them an opportunity to highlight their concerns. The PPCC chief, Capt Amarinder Singh, Leader of the Opposition in the Assembly Rajinder Kaur Bhattal and Jagmeet Brar would be among those participating in the meeting. He said the purpose of the meeting was to set up committees, from the booth to the state level, well before the assembly elections so that party activists had enough time to explain the policies and programmes of the Congress to the people. Charak would thereafter visit all district headquarters to meet the activists. Charak said he had asked Amarinder Singh and other senior office-bearers to be more accessible to the people and party— men.They had been asked to be available at least twice a week at the party headquarters in Chandigarh. He said specific duties would be asigned to the office-bearers and a review held by him every month. The partymen had been warned against washing their dirty linen in public, he added. The Punjab Medical Entrance Test (PMET 2011) of the Baba Farid University of Health Sciences (BFUHS) was conducted in an orderly manner here today. About 9,000 candidates aspiring to secure a berth in the total 1,700 seats for the MBBS/BDS courses in nearly two dozen medical/dental colleges affiliated to the BFUHS took the entrance test. As many as 44 examination centres (30 in Faridkot, 10 at Kotkapura and four in Ferozepur) were set up. To check impersonation and other malpractices, the university authorities had deployed tight police security and made all candidates put their thumb impressions on the question booklet as well as the answer sheet. No candidate was allowed to carry pens, watch and other articles inside the examination centre. The candidates was provided pens by the university staff at their respective seats. Besides, the image of every candidate along with the roll number card and the answer sheet was captured and the video recording of the whole event was also made at all centres. As many as five flying squads kept making surprise visits at the centres till the three-hour test concluded at 2 pm. Eminent educationists from different universities including the Vice Chancellor of Rajiv Gandhi National University of Law, Punjab, Dr Paramjit S Jaswal were seen supervising the arrangements. Most candidates, including Ekta Bhat (Jammu), Bikram Singh (Bathinda), Amrit Pal Singh (Ludhiana), Manpreet Kaur (Mohali), expressed satisfaction over the fair conduct of the examination. However, some parents, guardians of the candidates complained about the setting up of 40 out of the total of 44 examination centres in only one district (Faridkot). Even the officials of the BFUHS, who were on duty as invigilators, carried out the frisking of students, particularly boys, inside the examination centres. The BFUHS took a number of measures to strictly avoid impersonation during the PMET. A number of cases regarding impersonation during the PMET have been registered in Faridkot district in the last few years. The centres for PMET-2011 were set up in Faridkot and Ferozepur districts only to hold the exam in professional manner. Earlier, PMET used to be conducted at many centres across Punjab. "We have left nothing to chance to ensure that the PMET-2011 is conducted in a flawless manner without any leakage or impersonation," said Vice-Chancellor, BFUHS, SS Gill, adding that the result would be declared within 72 hours. He added that efforts had been made to prevent unscrupulous candidates from taking any advantage by way of leakage of question papers. Police sources said the answer sheets of the PMET, were kept in a highly guarded complex at Faridkot. Punjab Police personnel and BFUHS security personnel had been deployed for round-the- clock security of that complex. Gurmeet Singh Randhawa, SSP, Faridkot and Harjit Singh Pannu, SP (D), Ferozepur, said the PMET was conducted in their districts peacefully. Gurpreet Singh, SHO, city police station, Faridkot, said the woman, who entered the school, was identified as Manpreet Kaur. She was allowed to go after the chief observer of the BFUHS had given in writing that she had committed no offence as she entered inadvertently, he added. Meanwhile, the lanes and bylanes of Faridkot and Ferozepur towns witnessed traffic jams frequently. Candidates, who reached Faridkot, Kotkapura and Ferozepur last evening for today's test, faced difficulties in finding a suitable accommodations for the night. Despite an alarming rise in road accidents, there seems to be little improvement in basic infrastructure of the Traffic Police Department. Of the three highway patrolling vehicles deployed on the Delhi-Amritsar, Chandigarh-Ludhiana and Sirhind-Patiala roads to help accident victims, one has been in a workshop for the past three days. At the moment, the other two are forced to cater to a length of 69 km. The vehicles, most of them five years old, are equipped with a video camera, speed radar, searchlight and a first aid box. The cops deployed for patrolling said the first-aid boxes were provided five years ago and are now of no use. The vehicles also have no power point where its gadgets could be recharged. “We have to park vehicles at petrol pumps, dhabas and other public places to recharge the searchlight, speed radar, battery of video camera and cell phones,” said a cop. Five to six policemen are deployed in each vehicle. The number comes down to a mere two or three when some cops have to be put on VIP duty. Having done his graduation in engineering, Gurpreet, unlike his classmates who headed for corporate jobs, virtually took the path not taken: Decided to return to his village and take up dairy farming and pisciculture, even though his co-villagers were growing paddy and wheat then. But it was in 1996 that he finally decided to settle down for marigold cultivation. Now, he is growing several varieties like gladiolus, rose, marigold, gulzafri, statice, gypsophilla, etc. 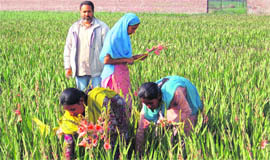 Gurpreet’s tale become even more significant as he himself has designed gladiolus bulb grader and gladiolus digger, which mean less labour and more output. And for such innovative ideas, he has bagged several awards, including this year’s Chief Minister’s Award in Horticulture. He has also participated in the world’s biggest auction of fresh flowers in Holland and also attended the World Rose Convention (2003) at Glasgow, Scotland, as a delegate. “I have set a rosewater plant for better returns from flowers during the off season when the demand for fresh flowers is on the decline. To save water, I have shifted to drip irrigation and mulching (by paddy straw) for rose cultivation and my water storage tank over one acre of land is also being used for fish farming,” he adds. On an average, a farmer gets less than Rs 1 lakh per acre per annum by growing wheat and paddy, but Gurpreet earns anywhere between 1.5 lakh to Rs 2 lakh from floriculture. “In paddy, there is a lot of input cost and dependence on expert labour, but in our fields it is simple work and usually I prefer giving employment to local village women,” says a rather pleased Gurpreet. Earlier, under the directions of Vice Chancellor Dr Jaspal Singh, the university’s Department of Sociology and Social Anthropology had submitted a proposal to the government, prepared under the supervision of Prof Birinder Pal Singh, Dean of the faculty of social sciences. After accepting the proposal, the government sanctioned Rs 8,36,400 for the purpose of carrying out the study on the lifestyles and socio-economic conditions of the Dakhni Sikhs of the southern states and Assamiya Sikhs. Dr Jaspal said that the Sikhs settled in southern and north-eastern states have lived through unique kinds of ordeals and tribulations which needed scholarly and in-depth study. “They have their own sets of demographic and psycho-graphic orientations which tend to make them an exclusive entity in themselves,” he said. Commenting upon the nature of the study, Dr Birinder Pal Singh said that collecting empirical data about these communities will open up new vistas to understand the socio-historical and cultural aspects of these communities, whose ancestors settled there long ago and also inspired other local people to adopt Sikhism. Aimed at easing traffic bottlenecks in the city, the Rs 29.25 lakh project would connect the Boat Club with the Ropar-Nangal road. Advocate Ajay Gupta, through his counsel RP Dhir, president of the District Bar Association, Hoshiarpur, filed a case, saying Digvijay Singh had hurt the religious sentiments of crores of people. By calling yoga guru Ramdev as a “ maha thug”, Digvijay Singh had tarnished the guru’s image in the eyes of the public. Dhir further argued that the Union Government was adamant on infringing the freedom of the people as prescribed under Section 90 of the Constitution. The Additional CJM fixed June 15 as the next date of hearing. The animal had been donated to the village panchayat for breeding buffaloes. The accused have been identified as Labh Singh, Atma Singh and Sandeep Singh. In his complaint, village lambardar Charaninder Singh alleged that the accused had thrashed the bull for attacking their buffaloes and damaging crops. The animal, rescued by some villagers, was rushed to the veterinary ho spital in PAU, Ludhiana. Investigating officer Harjinder Singh said the injuries to the bull would be recorded in a day or two and the accused arrested after that.